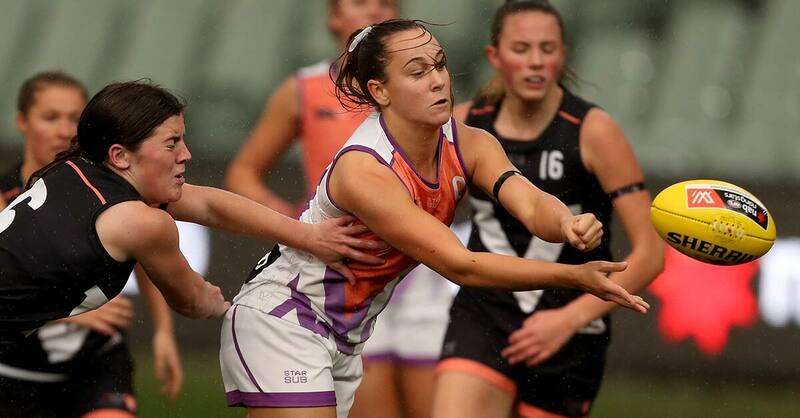 Football wouldn’t mean as much as it does today for AFL Women’s Draft hopeful Natalie Grider if it wasn’t for long-time teammate Gabby Collingwood. The pair’s journey spans back several years and is set to reignite later this month if Grider is drafted by the Brisbane Lions where she will undoubtedly line up alongside Collingwood, who joined the AFLW side via pick seven in the rookie draft one season ago. Both Grider and Collingwood began their footballing careers at the Jindalee Jags in Brisbane’s West where they were teammates throughout their juniors. Since, the pair have almost mirrored one another ahead of Grider’s potential selection by the Lions on October 23. Back then though, it was the latter who was the standout fir the Jags, and preferred playing in the boys’ division for the higher level of competition – perhaps the only time the pair were separated on and off the field. “She was always playing with the boys at Under 15 level and I was playing Under 15 Youth Girls when I was about 13 or 12 years-old,” Grider told aflq.com.au. The pair played at the Jags for three years until Collingwood finished off her final season in the Under 17 Youth Girls competition and then embarked on a move to QWAFL outfit University of Queensland. But given the rapport the duo has established over their tenure with one another, Grider packed her bags too and followed suit. “We both moved to UQ in the same year. I didn’t want to stay at Jindalee if she wasn’t staying either,” she said. But Collingwood’s role in Grider’s love with the sport spans more than just a handful of seasons they spent as teammates. As Grider recounts, the pair are best friends, and it was the older Collingwood who left a lasting impression on her. Without her influence, it’s unlikely Grider, despite her talents, would be on the verge of inclusion into the AFLW fraternity later this month. “She’s been my biggest role model through this whole journey and even when I didn’t believe in myself, she would. “In Under 15s, we were trying for the Under 15 Metropolitan West teams and she’d beg me to trial, but I never really thought I could. The decision to trial for that representative team has since paid dividends as Grider has manufactured a catalogue already glittering with accomplishments despite her lean age of just 17. This season alone, Grider was named captain of the Queensland Under 18 AFLW team which defeated Victoria Metro for the first time ever. Her efforts at the carnival were recognised by being named the state’s Most Valuable Player at the carnival where she also earned All Australian honours. At club level, Grider was named at the QWAFL’s top Rising Star for the Red Lions, earned a place in the 2018 QWAFL Team of the Year and claimed the UQ Best and Fairest in a three way tie with Megan Hunt and Jane Childes. But Grider isn’t done just yet, and has her sights set firmly on a spot on the Lions’ AFL Women’s list alongside her counterpart in Collingwood. Grider is currently one of three Queenslanders taking part in the AFL Women’s Draft Combine at Marvel Stadium in Victoria. The NAB AFL Women’s Draft will take place on October 23 at the same venue.